Everything we do revolves around live, work and play; and ultimately provides the measure of our overall wellness. The live aspect looks at your physical health; how well are you? How fit are you? What food do you eat? Are you free from disease and illness? Is your body at optimum weight? How much energy do you have to participate in life and how motivated are you to create the life you want? How do you live in the world, in terms of your environment? Do you look after your patch around water, food and waste? How do you achieve a sense of calm, of being at peace with the people and things around you? Where do you nourish your spiritual and how do you connect your physical to the spiritual? How engaged are you at work? Is the work you do your passion? Does it nourish your intellectual? We spend around 1/3 of our life at work or doing work, do you love what you do? Are you in control of your emotions can you express your emotions adequately and with respect in the workplace? How excited about life are you? What activities do you participate in outside of work? How exhilarating do you find these activities? Do your friends and activities excite you? Do you love and feel loved? 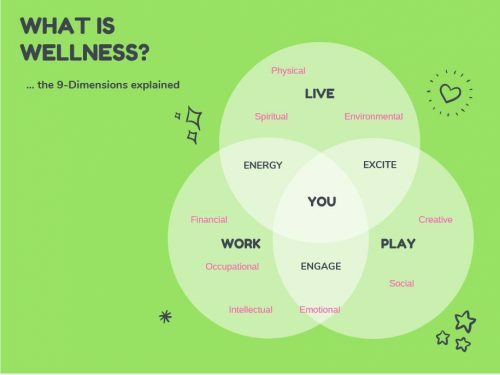 The 3-E’s of wellness cluster the 9-dimensions to enable you to get a sense of how the dimensions influence your life; the way you live – work – play. What is the question that Wellness will answer? 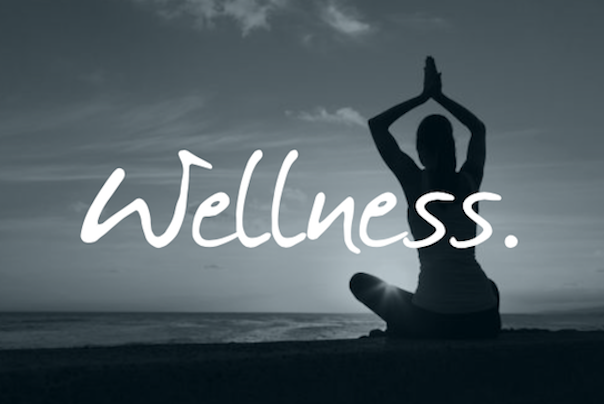 To be well is more than not being ill. Wellness refers to your overall well-being; it is a holistic approach that requires you to focus on those parts of your life that may require some attention. Wellness is a concept (plan or intention) or lifestyle (the way you live) that should not be bundled into the generalist category of fad. Sure there are many fads that can be subsumed by wellness but if you are truly interested in yours, make time to take a more in-depth look. It is not about popping a pill, drinking a shake, having a massage or reiki session, attending a personal development workshop, burning oil or signing onto a gym … yet it can also be ALL those things. For me, and what you will find within this Lifelong Learning site its beginning point has to be the relationship between mind and body. Many founding fathers and mothers of the personal development world have carried this phrase forward. I first stumbled across a model that looked at wellness in multiple dimensions, many years ago. The model isn’t attributable to any one researcher however it forms the basis of a universal approach to well-being. Some present the model in 4-dimensions, others 5 or 7 and for me I have identified 9. 9- dimensions of well-being that when nourished, provide opportunity for optimum wellness. These dimensions are physical, emotional, spiritual, social, creative, financial, intellectual, occupational and environmental. I immediately resonated with the need to explore many aspects of the Self because you will often hear the lack of some aspects of our wellness play out in daily conversations. On the surface these are pretty much stock standard conversation bites yet they reflect the mind-set of ‘never’, which is a focus on lack; the lack of opportunity, the lack of promotion, the lack of time, the lack of money. If, we become what we think about then is it any wonder we create a ‘self-fulfilling prophecy.’ That is, we end up creating the very lack we are trying to avoid. We become what we think about! So the perfect starting point is to create awareness of our thoughts and analyse them in context to each of the 9 dimensions in order to create strategy for doing something different or better. Just as our physical realm requires food and water (nourishment) so do each of the other dimensions. Here are a few questions to ponder where wellness, may just be the answer. How do you nourish your intellectual? What activities are you involved in that nourish your creative or social? How do you nourish your spiritual and emotional? What steps have you taken that nourish your environmental dimension? If you could change anything or do something different, what part (dimension) of your life would that be? Once you have identified a part of your life that you may want to do different or better (yes … change), then it is time to start building strategies. Strategies don’t have to be scary or hard, simply small tweaks to get you moving in a different direction. For example, if you lack social interaction join a group – dance, cards, or bird watching. If you don’t move enough make the decision to walk more and drive less. Get off your bus one stop earlier and walk. Join a walking group and enhance your social dimension also! These are just a couple of examples to demonstrate the change does not have to feel overwhelming. The key is awareness or as you will come to know through hanging out with me, they key is to create consciousness. Using the 9 dimensions allows you to focus on the entire YOU and slowly make the changes you can embed into your everyday life. It will eventually and simply become a no-brainer; the way you choose to live. How do I know? I’ve been there. It works.